I like all three of Trader Joe’s boxed mac and cheeses. 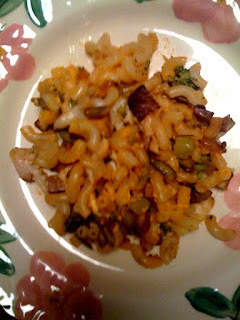 The dish pictured starts with Joe’s Gluten Free Rice Pasta and Cheddar. In addition to the box contents, the directions call for a quarter cup of low-fat milk. But I like embellishments, and can't resist adding more protein and pizazz to the basics. 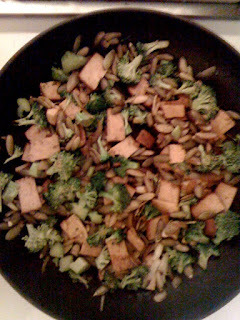 While boiling water for the noodles, I sauté a big handful of raw pumpkin seeds in grapeseed oil, then add chopped onions, thin slices of Trader Joe’s Original Baked Tofu (Savory Flavor), and chopped broccoli. 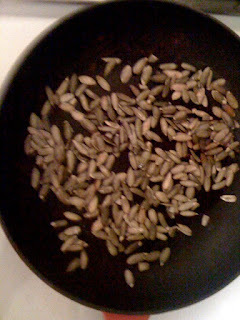 I spice with a big shake of cayenne pepper, a bit of rosemary, a dash of soy sauce and some artisan sea salt. All quantities should be to taste, but no single ingredient should overwhelm. The cooked noodles fit nicely in a Pyrex pie dish. 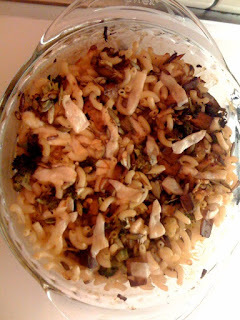 After mixing in the package’s powdered cheese and the low-fat milk, add the pumpkin seeds, onions, tofu and broccoli, then stir in as much grated goat Gouda cheese as you crave.